If anyone who reads this is a Rascal Flatts fan, you might recognize this blog title as a song title. The lyrics include the phrase “things that matter, things that don’t.” As Nikki and I wrapped up our year, that phrase was on my mind: focusing on the things that mattered, not the ones that didn’t. One of my tentative goals at the end of last year was to see if we qualified for the Pennsylvania National Horse Show (hereby referred to as “Harrisburg” in this post) in the amateur-owner jumpers, and if we did, to go again. The last time we went to Harrisburg, I rode like a coked-up lemur trying to do cartwheels on a treadmill—I really psyched myself out about being at Harrisburg—and I was hoping for redemption. So when I got our acceptance packet in my email, I was excited, especially since we would be going in off a national standard grand prix the week before, the best preparation I could hope for. Our Harrisburg prep show was the Minnesota Harvest Horse Show, where last year, we had some ups and downs. We had some ups and downs this year too; Nikki placed in both the welcome stake and the grand prix, I rode more efficiently through the turns to avoid time faults, but I’ve certainly given Nikki better rides. But we had a moment in the grand prix that gave me pause. During the prix, we started off well, although in the first related line, I did not help Nikki out enough and she had to work quite hard to get out of the first combination. Much to my surprise, at the next fence, she stopped. Now, Nikki will stop on the rare occasion where I make a decision that is truly insane, or if the footing is really slick, but that wasn’t the case here. I saw a forward, deep distance, she saw it as well, and got there to say “no can do.” Odd, for her. On our re-approach, we got to the same distance and she jumped it fine, and jumped around the rest of the course clear, but to me, she wasn’t quite the horse I’m used to. As we walked out on a loose rein and I patted her neck, I knew that we weren’t going to Harrisburg the next week. She was telling me something was wrong. Any horse show, whether it’s a schooling show or Harrisburg, doesn’t matter in the long run; my horse does, and I owe her everything. I’m relieved to say an extensive vet workup revealed some minor issues that have been taken care of, and Nikki is feeling much better now (she’s definitely keeping Momma Pope on her toes with some of the antics she’s apparently pulled when being hacked out in a field—that’s much more like the frisky, naughty pony we love!). I know skipping Harrisburg was the right call, and there’s no question in my mind about it. 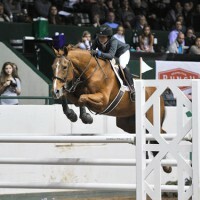 Nikki had another unbelievable year, jumping double clear rounds in some good classes. She was incredibly consistent, placing in every grand prix that we did, aside from one where she lost a shoe and I pulled up. My trainer got me to ride much more competitively in jump-offs with some lessons at home where I discovered that if she asked me if I’d do a certain turn in a class, the only answer is “yes,” as either way, I’d end up having to do it (and if I said “no,” I’d do it more times so I got more comfortable with it)—exactly what I needed! The last grand prix jump-off that we did was by far the best jump-off ride I’ve given Nikki in a prix. Both Nikki and I had fun being back in a program and having challenging lessons, and I’m already looking forward to having her back out here with me next spring. At this point in her career, I appreciate every ride, and any classes that we get to do are gifts. I love that my coming-20-year-old Thoroughbred is still my crazy little superball raring to go. There’s been a lot of talk online recently about bit choices, particularly regarding some in the eventing world. As someone who has a trunk full of unconventional bits, I’ve paid attention to these discussions, and the general misconceptions about Nikki’s bit are what prompted me to write my last blog about how the hackabit works. I think we’re all in this for the love and respect of the horse, and it’s a good thing that people are concerned about welfare issues in any discipline of the sport. But I think sometimes people can get a little carried away with the vigilante justice on social media. There are discussions that need to occur, and I’m certainly not a proponent of burying our heads in the sand and hoping everything goes away. Some things need to change, though. After I wrote my last blog, I got a lot of positive feedback from people who otherwise would have drawn some incorrect conclusions about Nikki’s bit. That’s great; that’s why I wrote it. But I also received several private messages through various forms of social media threatening me with harm for the supposed abuse that I inflict upon Nikki (remember, with her rubber bit). Someone was dedicated enough to track down where I work and send me a photo of the building, accompanied by a nasty message. For the most part, I think the people who are writing messages about bits are well intentioned and concerned for the horse, perhaps because in some cases, they don’t actually understand how the tack works, or that with a bigger bit, you can use substantially less hand. Having said that, what happened following my last blog is not OK. It’s good to have discourse and discussions about potential issues in our sport. It’s good to ask questions about things that don’t seem clear, like tack choices. I enjoy sharing my life with my blog followers—it’s fun and rewarding—but not when people take it that far with their disagreement with my training methods. So with that in mind, I’m taking a step back for a while. I don’t have much to blog about in the winter anyway, but I need to mull over some things and figure out what matters most to me. I really do enjoy answering questions about how I manage Nikki and plan out her year, and I love sharing the ups and downs with people, but I’m not willing for my posts to turn into open season on me. As I said before, I think discussion and civil discourse is great, but threats take it to a place I’m not sure I want to go. I’m going to manage this the same way I do when something doesn’t go quite right with a class: think it over, let it rest, and then come up with a solution. This winter, I’ll let it rest (while I contemplate the merits of hibernation; bears are onto something, I think sleeping all winter sounds phenomenal), and in the spring, I’ll re-evaluate and see. Emily Pope, 24, started her relationship with Seize The Moment, an off-the-track Thoroughbred and a chestnut mare, in 2006 and they began in the junior hunters. Emily quickly realized “Nikki’s” talents lay in the jumper ranks, and they worked their way from the junior jumpers to the grand prix.